On Wednesday, we ran one of our regular Simply Sausages courses, this allows each guest to work with a whole kilo of fabulous local free range pork as we explain the history of the humble banger and explain the ingredients, techniques and flavourings that contribute towards the perfect sausage. Each guest is able to create their own seasoning combinations adding additional fruit, nuts, cheese (or anything we can find in the kitchen) to ensure that their masterpiece lives up to their wildest dreams! Previous successes have included Honey & Ginger, Apricot & Walnut, Sage & Pear, Cheddar & Chutney and even an Orange Marmalade sausage. One of these days, I’m going to try a Fig & Stilton combination, but this week we chose a versatile Mixed Herb and a firm favourite Fennel, Chilli & Red Wine (which we are having tonight for supper). I’d made some rather successful sausage rolls last month and had some puff pastry in the fridge, so offered the opportunity to use some of the sausage mix to make sausage rolls whilst the rest was stuffed into traditional skins. We had heard about it through our good friend Anton Manganaro (Head Chef at BAFTA’s 195 Piccadilly), who was one of the finalists that evening, and after tasting his Venison Sausage Rolls at a recent party were very excited to support him in the competition. The pub was packed, the anticipation was electric, the great and good of the food & drink world were there and we were all excited to taste the creations submitted to the judges and put our hands in our pockets for the local charity Shooting Star Chase. Some of the entries were classic, some were exotic, some were filled with lamb, some with eel and the winning sausage roll had medallion of rabbit running through the middle. Anton’s were wonderful, here he is, below, holding his platter for the judges of free range pork and fennel sausage roll with ham hock cooked in homemade stout, hopped HP, mushroom ketchup and pickled onions. It all tasted amazing and I was proud to discover that his mushroom ketchup was sweetened with our Hen Corner honey! Here’s a little film of the highlights. Our Courses have got off to a good start this year, with some people determined to learn a new skill and others redeeming gift vouchers that they had been given recently. We are currently working with three London Schools, one to help them start with Chickens, one for an exciting Bee project and another to teach Cheese Making to their GCSE students. The Micro Bakery has been very busy over the last couple of weeks, we are thrilled that customers love our products and are planning how to increase supply and ensure everything is ready on time. Prioritise the tree work in the garden, we need to seize the day and get pruning that we can reach and book the professionals for the bigger trees that are reaching for the sky. Bubble up as much marmalade as we can, the Seville Oranges are in season now and are perfect for that bittersweet preserve of kings. Collect a couple of new chickens, we know that their eggs will be in high demand as they come back into lay over the next few weeks. 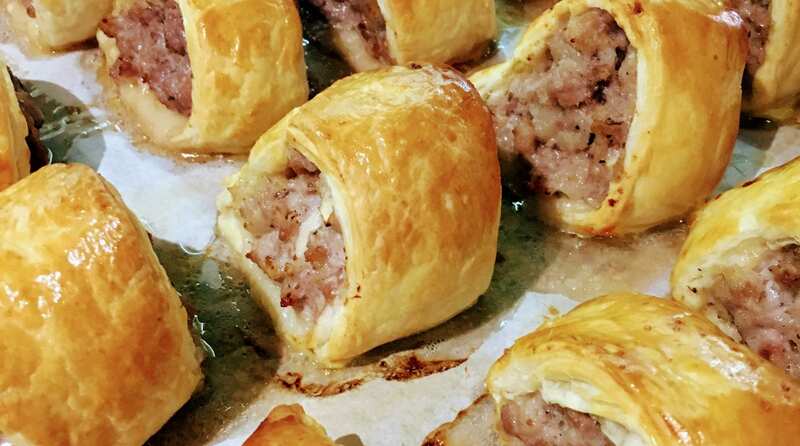 Have you ever made sausage rolls? What would make your dream combination for the perfect filling? Think Summer, think strawberries, think afternoon tea… Whilst the strawberry jam is bubbling to the perfect set, we will roll up our sleeves to bake hand-made scones together ready for our afternoon tea.